DC is subtle at times. But the subtlety of House Speaker Nancy Pelosi in cleaning up her latest mess has all the subtlety of speaking through a bullhorn at a cocktail party. Pelosi tried to sneak this retraction in. But in a sign that Jussie Smollett is persona non grata within the political community, the Speaker deleted a tweet expressing sympathy for Jussie Smollett. The racist, homophobic attack on @JussieSmollett is an affront to our humanity. No one should be attacked for who [sic] they are or whom they love. I pray that Jussie has a speedy recovery & that justice is served. May we all commit to ending this hate once & for all. Powerful words from the third person to lead America in the event of something happening to the president or vice-president. And Pelosi is correct in everything that she wrote. So let’s examine those words applied to the real victims. Because Conservatives were attacked by Jussie Smollett for who we are and who we love. 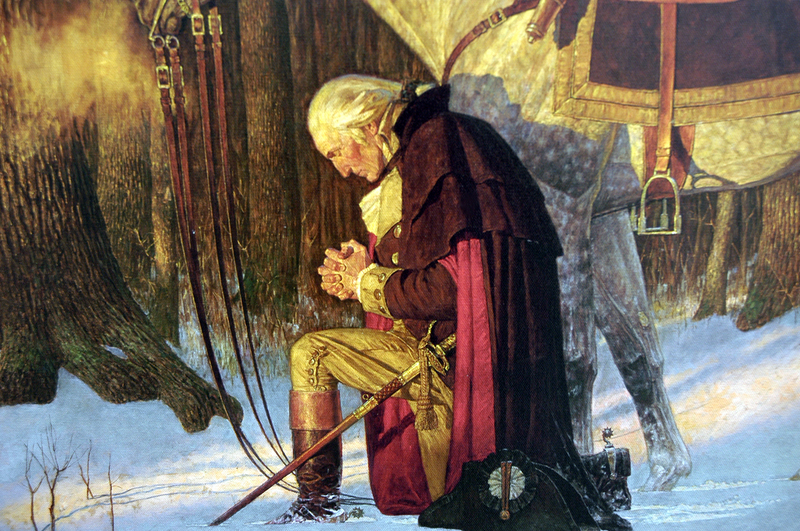 Will Pelosi pray for our speedy recovery in this vicious attack on us? Or will she ignore the wounds suffered by us? 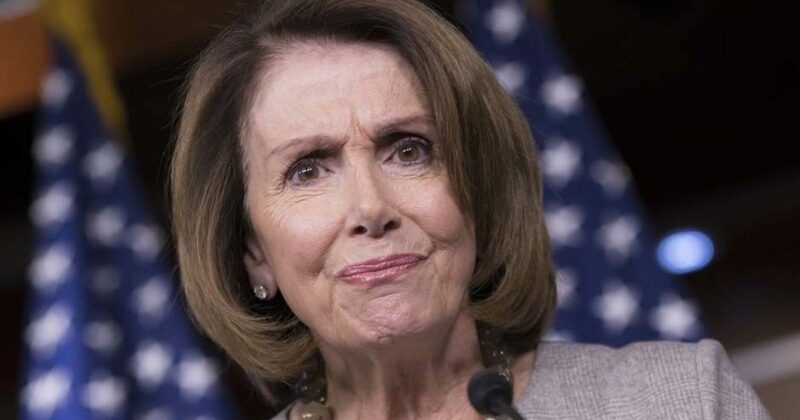 And as Pelosi suggests, can we end the hate…of the Left? A hatred so putrid that they FAKE attacks in order to promote their lies? 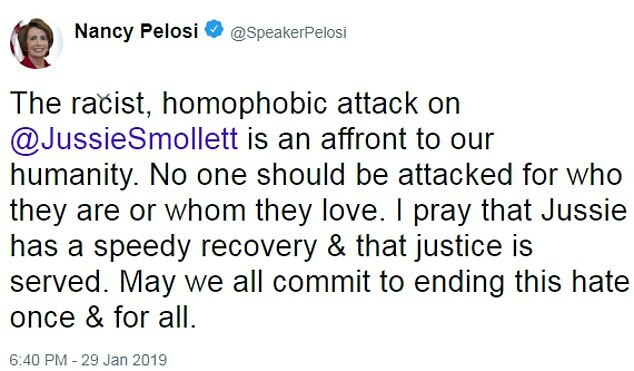 Will she condemn Smollett’s actions. Further, will she condemn her own actions, as she believed the liar. I suggest that Pelosi and others like Kamala Harris look at their actions during the Kavanaugh hearings, if they need an example of how their injustice impacts lives. As for justice being served, from her lips to God’s ears. I’d love to see justice dealt out fairly in this situation. Because mankind would be better served if Smollett was made to fully pay for his lies. Pelosi posted that tweet before she knew anything about the attack. Like Obama with Professor Gates, where he alleged “The cop acted stupidly”, Pelosi jumped to conclusions and used not a single brain cell to evaluate this farce. A moron could have seen through Smollett’s farce, yet the third person in charge of our government missed it. Just as with the attempted destruction of Kavanaugh, the Left moves along as if nothing happened. They couldn’t care less about the fallout. I asked in the case of Smollett, what if two white men had been walking in that area during that time. What would their lives look like now? Certainly they would eventually be released after they provided enough evidence to support their alibis. But what would have happened to their lives? The vicious attack on actor Jussie Smollett wasn an attempted modern-day lynching. I’m glad he’s safe. To those in Congress who don’t feel the urgency to pass our Anti-Lynching bill designating lynching as a federal hate crime-I urge you to pay attention. I wonder when Senator-turned-Presidential candidate Cory Booker will remove his tweet. Now that we know a “modern-day lynching” didn’t occur. And in fact, the only modern-day lynching in recent memory was that of Brett Kavanaugh. No, Senator Booker, I see no urgency here. And in your words, “I urge you to pay attention”. Update: Video of Booker refusing to answer the question about this hoax. 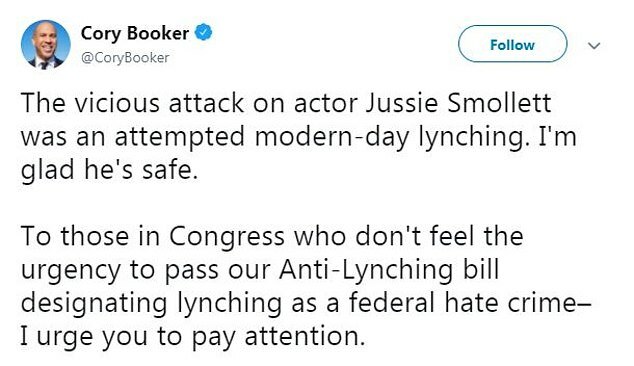 Then this walking abortion has the nerve to accuse Conservatives of committing “the majority of hate crimes”.
.@SenBooker says he’ll wait for the facts to come out before passing judgment in the #JussieSmollett case. Too bad he didn’t exercise the same discretion and responsibility with the false allegations against Justice Brett Kavanaugh. Anybody think Booker will apologize to the pro-Trump supporters who were falsely accused by him and the multitude of others? I think his response in the video answers that question. Thankfully, this piece of sh*t will NEVER be president of the United State. And Leftists who put him in office should be ashamed of themselves.